How do I make an MMD music video? 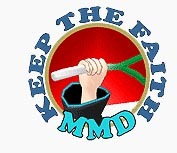 Where can I download what I need to make an MMD music video? This video is just a 90-second test of a fun project you can download and try using MMD. I loaded my models… loaded the motion data… loaded the WAV file… and pushed PLAY. That’s all there is to it. 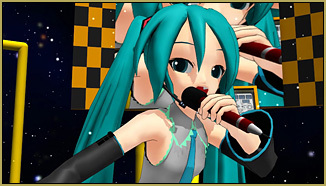 Make a “Dream Fighter” MMD Music Video! This project was recommended to me as a nice project for LearnMMD’s readers to try out. 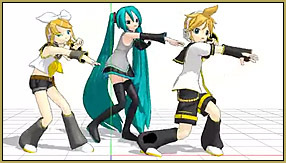 … It uses three models (probably should be MALE models I am told, but Miku and Rin work well! )… and the motion is really nice! The motion IS really nice… created by wasabi P back in 2010. You are going to want to add some microphone accessories into those empty hands! Deviant Art’s Trackdancer has a nice “microphone pack”. I have spent a couple of hours playing with this project and I have decided it’s just TOO LONG for me to recommend it without hesitation. This motion data and song stretch out for nearly FIVE minutes, over 8800 frames! … and with the song being a Vocaloid-generated Japanese-language song, I just couldn’t get into it… didn’t care to start, didn’t want to create the full video. … so that test video animation was all I completed. That being said… This would be a GREAT piece if you wanted to dazzle us with camerawork and stage-changes… it’d be boring to watch these three singers on a nice stage for the whole five minutes… but with a “pizazz of camerawork” and MME effects, and some amazing stage changes… maybe a couple of model changes, as well… this might be fun to watch. … (You might also want to cut the song down to a length you can handle… 90-seconds? ?… and then adjust the motion to fit). At the end of the dance, the motion is very nice as the models strike their final poses. That WAV file is HUGE… a full five minutes…53.9Mb! … on my DSL connection, mid-day, I never did download the whole file!… only got about 40Mb at best… I may try again after midnight when there is less web traffic. “:o). I knocked-out this version of the animation this morning… spending a little over three hours as I tried out different camera angles and effects. 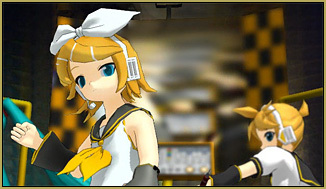 I chose to use that nice Sci-Fi stage, Neru’s Soapbox, by Trackdancer. The link for it and a write-up are in my Bo Beep Bo tutorial. That stage wasn’t designed for three such active performers, so I used the Si size set to 1.80 (180% increase in size) for both of the .x stage parts. The dancers still seemed to be at the back of the stage… so I used the Z at 5.0 for the Soapbox.x piece to move the stage back a little so the dancers were nearer the center. The rotating Soapbox Base.x was attached to a dummybone that had that rotating motion data driving it. I couldn’t move the Base.x in relation to the dummy bone; I had to move the Dummybone Z +5… except it had motion data every 250 frames… so I did a Range Select on the data for frames zero thru 9000… copied, and pasted it back into place using Apply Center Position Bias with a Z of 5.0 … that did the trick! I worked-out the camera motions so that the camera is always in motion… always moving. I hate it when an animation has the camera, the scene, locked into place. It’s so much more natural to have the camera in motion… even if it’s only a slow zoom-in or a slow pan. I added SSAO_Lite to get some nice depth of color. I added SvDOF so I could adjust the depth of focus. I adjusted the Si setting, changing it often throughout the animation for a softer look on that reflection screen and to highlight the key players. I added Beamman’s KiraKira v2 effect to add those sparkles to the solo moments. … You will also note that I used the Display checkboxes on the accessories and models so as to have them out of the scene during the solo shots. Download the motion data… download the WAV if you can… and give this dance a try. It’s cute… fun… and really LONG!